Located on an island just off the coast of Malaysia, Singapore is one of the most remarkable countries in the world. Despite its small size it boasts a powerful economy in a beautiful tropical setting and is considered by many to be the center of global finance. 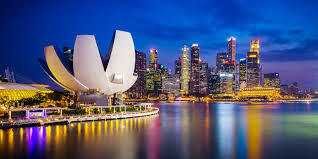 As such, Singapore has extensive connections with many other countries around the world including Canada. Indeed, many Canadian individuals and businesses attempt to establish themselves in Singapore for purposes of citizenship, employment, further education, partner with Singaporean corporations, or sell their pharmaceutical products in Singapore. All of these purposes require a series of accompanying Canadian documents such as police checks, university degrees, birth certificates, personal and corporate powers of attorney, certificates of incorporation, and certificates of pharmaceutical products. However, documents issued in foreign countries will not be accepted in Singapore until they have gone through a process that ensures they are legitimate. This process is commonly known as the Apostille process and it is used by dozens of countries around the world. Singapore and Canada are a few of those exceptions; neither has signed the Hague apostille convention. 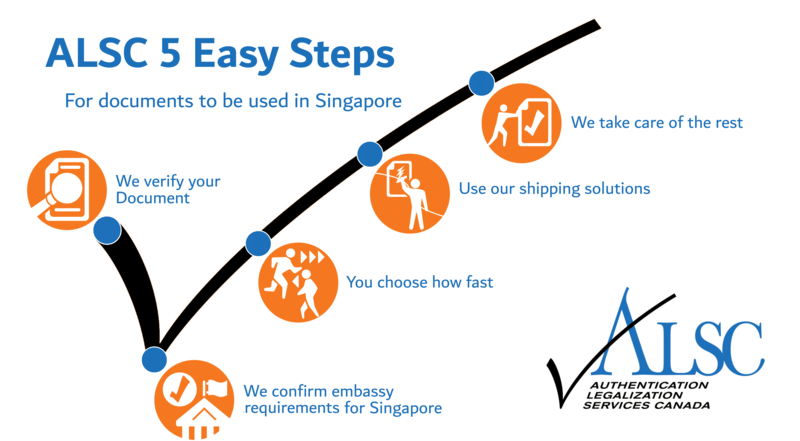 For Canadian documents that need to be used in Singapore and elsewhere overseas, they must go through a two step process known as authentication and legalization. If you have been told to get a Canadian apostille for Singapore, this is what you will actually have to do it. Authentication and legalization is equivalent or equal to an apostille. In short, you’ve come to the right place. The first step of authentication takes place at Global Affairs Canada. In order for them to authenticate your Canadian document, it must contain a signature of an authorized individual they have on file which they can deem authentic. This includes signatures from Canadian lawyers, notary publics, select members of the RCMP, and signatories at the various provincial vital statistics offices across Canada. Once you have also met their other requirements for authentication, one of their agents will place his or her stamp, seal, and signature on your documents, completing the authentication stage. Authentication of documents received by mail or courier can take as long as 20 business days to complete. Next your document must go to the consular section of the embassy of the country in which you wish to use your documents. In this case your authenticated documents would need to go to the consular section of Singapore. They also have their own requirements, fees, and processing times which are subject to change at any time. Once you have met these requirements and paid the appropriate fees, the consul will legalize your Canadian documents making them valid for use in Singapore. This process seems simple enough but its long processing time and changing requirements make it incredibly difficult. Delays are very common and can cause significant stress if you are rushing to meet a deadline in Singapore. Luckily, there is a way of significantly speeding up your processing time and ensuring no errors occur at the authentication or legalization stage: ALSC. For over 25 years we have been making Canadian documents valid for international use including high school diplomas, transcripts, police checks, birth certificates, marriage certificates, certificates of incorporation, corporate powers of attorney, and certificates of pharmaceutical products. In fact, we are the first company to provide this service and the processes we developed have become the industry standards. We have helped thousands of Canadian professionals, businesses, law firms, pharmaceutical companies, and engineering companies save up to 20 business days on their processing time by using our priority same day authentication services. We also offer standard 3 business day and 10 business day economy authentication service speeds tailored to balance affordability with processing speed. In all cases you save time and our service guarantee ensures your Canadian documents will be properly authenticated and legalized for use in Singapore. Although we cannot influence the processing time of foreign embassies, the close professional relationships we have built with the consular staff of almost every embassy in Ottawa and dozens more across Canada allows us to be up to date on ever changing requirements and fees, sometimes even before they are changed. This is one of the many benefits of becoming our client. When you choose our services, one of our agents personally walks you through exactly what you will need to prepare your document for the process including the complex and often confusing requirements for legalization. Once we have received your documents and the process has begun, you will receive detailed updates at every stage and our agents will be available at all times during our office hours to answer your questions and address your concerns. Upon completion we can ship your documents anywhere in the world they need to go via one of our many trusted shipping partners. If you have Canadian documents for use in Singapore you should contact us, especially if you are rushing to meet a deadline. In the meantime, refer to the rest of the article for additional details on some Canadian documents commonly required for use in Singapore. Canadian educational documents such as high school diplomas, report cards, and transcripts are commonly required for use in Singapore for purposes relating to employment or education. Most Canadian educational documents contain signatures that are recognized by Global Affairs Canada which makes them valid for authentication in their original form. However, this is not the case with all educational documents. Educational documents issued from public school boards and related institutions will need to be signed by either the principal, vice principal, or a minister of education. Educational documents issued by private institutions will need notarized copies made by a Canadian lawyer or notary public in order to be valid for authentication at Global Affairs Canada, and there are select educational documents such as certain TESOL or TEFL certificates that cannot be authenticated even if they have been notarized or made into a notarized copy. If you are uncertain whether or not you need to make a notarized copy of your educational documents for use in Singapore, contact us. Our experts will advise you as to what you will need to do to ensure authentication and legalization of your Canadian educational document for Singapore. If you choose to use our services we can even make these notarized copies for you. Another document that is commonly requested along with educational documents for employment or education in Singapore are Canadian police checks. These can be either locally issued police checks or police checks issued by the RCMP headquarters in Ottawa. There are hundreds of local police checks which can be issued in Canada and in comparison to RCMP checks they are usually easier to obtain. However, locally issued police checks require notarization for authentication whereas RCMP police checks issued by their headquarters in Ottawa come with signatures already recognized by Global Affairs Canada. Furthermore, locally issued police checks are not always accepted by requesting parties overseas since they are only based on name and date of birth. This makes them less thorough than RCMP police checks which also contain fingerprints as well a name and date of birth. The RCMP is also recognized internationally whereas local police stations are not. This further adds to the validity of the police check in the eyes of many requesting parties. As such, RCMP checks are almost always the preferred police check for use in Singapore. If you need to get your RCMP police check, you can do so by clicking here. Our office is only minutes away from the RCMP headquarters here in Ottawa. This means you can save time if you have your RCMP police check sent to our office directly from processing especially if it will come from the RCMP headquarters. This is especially recommended if you are currently located outside of the country. When it comes to things like applying for citizenship in Singapore, getting married in Singapore, or resolving inheritance matters in Singapore, you will inevitably require a vital statistics document such as a birth certificate, marriage certificate, or death certificate. Like all other Canadian documents for use in Singapore, these will need to be authenticated by Global Affairs Canada and then legalized at the consular section of the Singaporean embassy. In contrast to many other Canadian documents, the signatures found on all Canadian vital statistics documents are recognized by the agents at Global Affairs Canada which makes them valid for authentication upon issuance. This also means that they do not require notarization by a Canadian lawyer or notary public. Notarized copies are also not recommended since they are often more expensive than simply using the original vital statistics document, which is preferred in almost every case. Note that Canadian vital statistics documents must be ordered from the province in which the life event occurred. Marriage certificates issued by the church and death certificates issued by the funeral home are not valid for authentication at Global Affairs Canada even if they have been notarized by a Canadian lawyer or notary public. Another thing to keep in mind before ordering your Canadian birth certificate, marriage certificate, or death certificate is to make sure you get the long form versions wherever possible. This usually applies to birth certificates and their long form versions can be referred to as a copy of an act of birth or a registration of live birth depending on the issuing province. If you need to order your Canadian vital statistics document, we recommend you have it sent directly to our office to save time if you intend on processing it for use in Singapore. Many of our clients choose to do this and those that did are happy they did! Order your new Canadian birth certificate, marriage certificate, or death certificate using the helpful links below. Getting your Canadian documents ready for use in Singapore is very difficult to do without help. Even if you are familiar with the authentication and legalization process, the processing times, fees, and requirements change so often that they have likely changed since you last went through this process. In short, the process may change each time you go through it. Since Global Affairs Canada as well as most foreign embassies are located within Ottawa, it makes it very difficult to resolve any issues that may arise. Poor communication is one of the common causes of delay. The agents at Global Affairs Canada and staff at the consulates of the various embassies are usually already busy with requests for assistance and are working hard to resolve an often long list of existing issues. What this means is countless delays for you and an increasing likelihood of missing your deadline. This is why thousands of Canadians choose our services every year. Our A+ rating with the BBB, proud membership with the Canadian Chamber of Commerce, and growing number of 5-star Facebook and Google reviews are proof that we are the best option when it comes to authentication and legalization services. In fact, we offer free shipping via FedEx to clients who use our service centers and drop off their documents for processing at our headquarters in Ottawa. When your documents have been completed we can send them back to any one of our service centers at no charge via FedEx for pickup or ship them elsewhere in the world at an additional, affordable cost. We promise you one of the most professional services you will ever encounter. Stress-free, efficient, fast, and guaranteed. That’s what you get when you choose ALSC. Click below when you get started with the experts with your Canadian documents for use in Singapore!